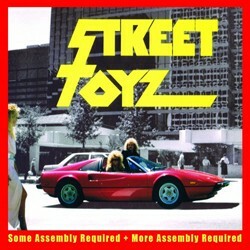 FnA Records were able to get their hands on the last remaining handful of still sealed vinyl records of Street Toyz’ 1987 album ‘Some Assembly Required’ and is making them available to the first handful of fans that want this collector’s item. Additionally, FnA Records will be selling a new Street Toyz album entitled ‘Some Assembly Required + More Assembly Required’ in CD format, as an autographed CD fan pack, and as a CD/Vinyl Collectors package at fnarecords.net. Street Toyz plain and simple was a band in overdrive. Like it or leave it, they raised the bar for every band that played the Dallas scene in the 80’s… and then they shut that bar down! Other bands took their lead from the roadmap that Street Toyz paved; their professionalism was second to none, their product rivaled that of the majors, and their live show… well that was the cherry on top of the sundae. In the summer of 1985, Jimmy K Simmons and John Leasure formed Street Toyz (the original working name for the band was Soakin’ Wet). John and Jimmy eventually moved to Dallas, Texas, which would ultimately become home base for Street Toyz. They obtained an apartment and rented a rehearsal room at Musicians Exchange. The year was now 1986 and the guys decided on Chris Debray (drums) and David McKnight (bass) as the rhythm section to complete the band — and so started the foundation of the band and a long wild trip. Jimmy buckled down and wrote the music and arrangements for the songs on the original album and John completed the songs lyrically (with the exception of “She’s Alone” written completely by Jimmy). The eighties were rolling along full speed ahead and the band was living the life of rock stars (well rock stars without a lot of money, but whatever the band lacked in money they more than made up for in the women department). Street Toyz also kept good company with other talented musicians. Down the hall was a newly formed band called Tracy Lords (later changed to Lord Tracy). Tracy Lords/Lord Tracy was made up of Terry Glaze (fresh out of the band Pantera as their front man), Barney Wolfe, Chris Craig, and Jimmy R.
In 1987, Street Toyz entered the Planet Dallas Recording Studios and recorded ‘Some Assembly Required’. When the album was finished, they had to let David go and thus began a continuous rotation of bassists in and out of the band. The guys lived this band as if it were a day job and refined their live show so that it was flawless — and many industry people took notice. One of those guys was Madd Maxx from ZRock Radio. He saw Street Toyz play at one of their many performances at Dallas City Limits and thus began a long beloved relationship between Madd Maxx and the band. He took such a liking to the band that he was playing every one of their tracks in regular rotation; this was huge considering that ZRock was ‘THE’ metal radio station for the entire US at the time. ‘Some Assembly Required’ remains a highly sought after album by hard rock aficionados and those who can get their hands on a copy usually wind up shelling out $50-$60 for the vinyl. For those long time fans who have wanted the album at a decent price, remastered and with bonus tracks — the wait is over! FnA Records were able to get into the vaults and obtain the original well-preserved reels for ‘Some Assembly Required’ and then had those five tracks from that album fully remastered. Tracks 6 to 8 features unreleased songs from what Jimmy K. Simmons considers the “best and most cohesive” version of the band and those tracks definitely show how the band was progressing and why they were catching the attention of the majors. The last 3 tracks showcase some of Jimmys flair for writing powerful, melodic, and catchy tunes and were recorded with long-time friend Bo Bullock. Those who rocked hard and played hard on the Dallas rock scene in the 80’s recognized that Street Toyz was a notch above the competition. They gave way to bands like Lord Tracy and Pantera and played host to an on-going rock-n-roll party night after night.